ElectronicKitSchool. - Proteus 7 professional has update their version with Proteus Professional v7.2 SP2 for Windows system. With this software you now can build electronic project simulation firstly before implement to real condition to know how your project will work perfectly. 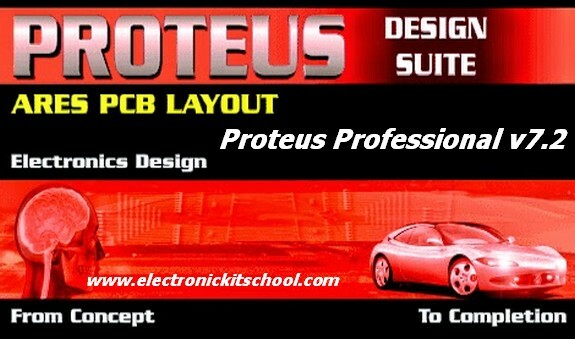 Proteus Professional v7.2 SP2 for Windows also provide the features that called with ISIS and ARES that allow you to design electronic circuit and simulate it and then you also can create PCB layout design at once using this software. In this article we will give you global overview about Proteus 7 software, the features, system requirement and the last we will give you the link that allow you to take free download Proteus Professional v7.2 SP2 for Windows. And we don't forget to give you guidance about how to install this software to your computer easily. And now you can click the icon link below to continue download Proteus Professional v7.2 SP2 for Windows. There are two files that you show download.